Adolescent Vaccination Recommendation: The polysaccharide pneumococcal vaccine (PPSV) is recommended for adolescents with certain underlying conditions, such as: diabetes, chronic lung, heart, kidney, or liver disease, or alcoholism; a cochlear implant or cerebrospinal fluid leaks; weakened immune systems due to such conditions as cancer or HIV infection; damaged or non-functioning spleen; sickle cell disease; or who reside in chronic-care or long-term care facilities. Although the incidence of pneumococcal disease among adolescents is the lowest of any age group, about 6.8 million children and adolescents age 2 to 18 years have chronic illnesses―diabetes or chronic heart, lung, liver, or kidney disorders―that place them at high risk for pneumococcal disease and related complications. 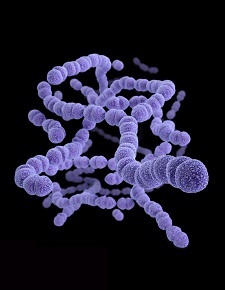 Pneumococcal disease is caused by common bacteria (Streptococcus pneumoniae) that can attack different parts of the body. When these bacteria invade the lungs, they can cause pneumonia; when they invade the bloodstream, they can cause blood infection, and when they invade the covering of the brain, they can cause meningitis. The bacteria can also cause middle ear infection (otitis media) and sinusitis. The symptoms of pneumococcal pneumonia include fever, cough, shortness of breath, and chest pain. The symptoms of pneumococcal meningitis include stiff neck, fever, mental confusion and disorientation, and sensitivity to light. The symptoms of pneumococcal blood infection may be similar to some of the symptoms of pneumonia and meningitis, along with joint pain and chills. The polysaccharide vaccine (PPSV) protects against 23 of the most common Streptococcus pneumoniae strains. Protection against the disease is especially important during influenza (flu) season because pneumococcal infection can be a serious complication of flu. Talk to a healthcare professional if your adolescent has an underlying medical condition that would put him or her at increased risk.